Article teaser: Japan's amateur community loves to get together every midsummer and have fun under the stars. What better place to do it than at Tainai? Editor's Note: The Tainai Star Party in Japan is the world's largest annual summer gathering of sky enthusiasts, hosting at times up to 20,000 participants during the three-day event. Most attendees hail from Japan, but others have flown in from Australia, Italy, France, Korea, Malaysia, Taiwan, and the United States. Here's the story of how one man's vision resurrected an astronomy festival and turned it into a world-renowned "mega event." In August 1974 well-known astrophotographer Akira Fujii started a popular annual astronomy gathering in Japan. Fashioned after some of the major American star parties, such as Stellafane and the Texas Star Party, the "Invitation to Starlit Skies," as the event became known, promised to bring together Japanese amateurs under a dark sky so that they could observe, show their wares, share their knowledge, experience camaraderie. At the time no such gathering existed in the country. Since the event had to take place away from city lights, Fujii selected a national park on Mount Azuma in Fukushima Prefecture, about 200 kilometers (124 miles) north of Tokyo. Here, at an elevation of 1,500 meters (4,950 feet), the sky was dark enough for the Milky Way to be clearly seen with the naked eye. The star party was an immediate success. More than 2,000 amateur astronomers from across the country flocked to the site, many bringing their homemade telescopes to exhibit them. The first time I participated, in 1977, I arrived on the mountain with a truck carrying my homebuilt 155-millimeter (6.1-inch) equatorial telescope weighing some 150 kilograms (330 pounds). My friends and I were so fascinated by Fujii's star party that we became regular participants and, eventually, volunteers. But in 1984 he announced that he could no longer host the event. It was a sad day for many of the attendees, who saw it as one of the most significant and fun-filled astronomy events in Japan. Fortunately, before Fujii let go of the reins, I had been considering hosting my own event someday. In fact, I already had in mind a location for the new star party -- Tainai Hill in Kurokawa Village, Niigata Prefecture, about 250 km north of Tokyo; my friends and I like to observe the Perseid meteor shower each August from there. Tainai Hill is a hilltop park with beautiful mountain scenery and a dark sky. Its campgrounds can also accommodate thousands of people. My vision for the star party was the same as Fujii's -- I wanted a public event for people who love the sky - but I also wanted it to be a super event. At first, I couldn't imagine that the Tainai Star Party grew bigger event than the Fujii's star party. It seemed to me that Tainai Hill was huge enough for my star party. Anything large, I knew, could not be run on my own, so I took my plan to the editorial staff of Tenmon Guido, Japan's leading astronomy magazine. Its editor Yukihiro Takatsuki loved my idea, and they promised to support it. For example, to find out what people wanted in a star party, they helped me conduct a survey of the amateur community. They also assisted in publicizing the event. In May 1984 we traveled to Kurokawa Village and met with Eizaburo Ajiro, chief of the village's commerce and tourism department, which manages Tainai Hill. I wanted the star party to be an annual event, so I proposed that Kurokawa be one of its sponsors. (Experience has taught me that events like these, organized by outside individuals or clubs, become a problem when the host town or city doesn't benefit or profit from the event but the individuals or clubs do.) I'm grateful for the village's decision to accept our invitation. At first village officials didn't know how to assist us; they had no idea what a star party was. But the solution was simple: the staff of Tenmon Guide? and I would plan and run the event, as long as we could advertise that the star party was being hosted by Kurokawa Village. They accepted my proposal. We all agreed that the first Tainai Star Party would be a tamed-down version of my original grandiose idea. We were, so to speak, testing the waters. We decided to hold the event at the end of August that year and limit it to one night. Tenmon Guido then advertised the star party and got telescope manufacturers and dealers involved. It was truly a homegrown star party, one with very humble expectations. Indeed, only some 200 people showed up for the first event. But the participants clearly had fun. As master of ceremonies we hired comedian Koen Yanagiya(a stage name),well known for his rakugo (traditional Japanese sit-down comedy or comic story telling). His hilarious "bash auction" of telescopes and goods donated by vendors was extremely popular (it remains so to this day). All in all, the initial Tainai Star Party was a success, with amateurs enjoying observing with and testing the newest commercial telescope models on display. For the next star party, in 1985, Tenmon Guido gave the event greater publicity. The magazine's staff also suggested that it should have more live entertainment. Clearly, people were coming in to have fun -- that's when we came up with the idea of adding a rock concert. We also extended the star party's duration to three days and two nights (it remains this way today). These changes seemed to work -- in 1985 our attendance figure increased to 1,000; the following year it doubled in size. The appearance of Halley's Comet around this time certainly helped boost the public's interest in the night sky. After the comet craze I decided to shift the focus of the star party from an event solely for serious amateur astronomers to one that kids, adults, families, and the general public - who didn't necessarily know much about astronomy - could enjoy. I believed such a family-oriented gathering would be the best way to recruit young people into astronomy. As a result of this shift, the Tainai Star Party flourished - becoming even larger each succeeding year. After five years the star party had become the biggest public event in Kurokawa Village. Today our attendance figure over the three-day period has reached a record total of 20,000. That's when the village really gave us its all-out support for our cause. Together we found ways to share the responsibilities - as the star party's official host, Kurokawa began to shoulder the cost of electricity, the use of exhibit halls, and putting up displays. Tenmon Guido continues to handle publicity and technical support. And my company, the Japan Planetarium Laboratory (JPL), became responsible for the event planning and administration. This strong collaboration has made it possible for me to visualize Tainai Star Parties well into the future. Next year we'll celebrate our 20th anniversary. One of the pressing issues confronting us today is how to finance the cost of this ever-growing "mega event." Since the star party's inception, we've relied heavily on volunteers for help. Right now, we depend on the services of about 20 volunteers. In return, the star party covers their board and lodging from the profits we make at the auction as well as from donations and the sale of star-party posters and T-shirts (which I designed). But due to the current economic recession in Japan, our budget for supporting the volunteers has decreased. For the same reason, we cannot depend on Kurokawa Village's star-party budget to remain the same. For now, it appears that the solution is to collect booth fees from exhibitors; currently we don't charge vendors for displaying their goods. I expect everyone will cooperate and do whatever it takes to keep the Tainai Star Party alive, because this is the wish expressed by the attendees. Another issue is that, after nearly 20 years of dedication and hard work, our volunteers are getting old. In the beginning, when I was only 25, I could walk around the field in bare feet to direct the programs. Today, even though the programs proceed without my direction, I get blisters on my feet without even walking. Soon, I believe, we'll have to figure out how to pass the star-party torch to a younger generation of volunteers. Then there is the issue of time. As the event grows, it requires more and more time to plan, coordinate, and carry out. My colleague at JPL, Nanayo Wakiya, and I must sacrifice a week of work just to process all the registrations. Each year, I also regret that I cannot spend as much time as I would like with star-party guests, especially those who have traveled from overseas, because I'm so busy. But I'm always happy to learn that most participants enjoy themselves and leave with a smile, saying: "It was so much fun. We'll be back." Such comments give me the energy to carry on. Above all, my biggest boost comes from my young children -- and those of others -- who look forward to the star party each year. I cherish their smiles the most because they tell me we're doing something right: we're reaching the younger generations and are teaching them about the beauty of the heavens. Potentially some of the elements of the Tainai Star Party will continue to evolve in the coming years. But the event's original goal -- to unite sky lovers from all over the world under the beautiful starlit sky of Tainai -- will remain unchanged. This year's star party is slated for August 23-25. There is no registration deadline or fee. Just come and enjoy yourself. For more information contact me at numazawa@jplnet.com or go to my Web site at www.jplnet.com/tainai/. <caption>Each August thousands of Japanese amateur astronomers and their families leave their crowded urban centers and converge on a hilltop park in Niigata Prefecture, 250 kilometers (150 miles) north of Tokyo, for three days of a carnival-like astronomy get-together -- the Tainai Star Party. This free annual event, now in its 19th year, features guest speakers, commercial exhibits and demonstrations, nighttime live entertainment, kids' activities, swap tables, raffles, auctions, and lots more. Unless otherwise noted, all photographs in this article are by the author. <caption>At Tainai amateurs get a chance to try out the latest commercial telescope models, though, owing to the bright surroundings, the test objects are largely limited to the Moon, planets, and brightest deep-sky targets. More than two dozen manufacturers and dealers participated in last year's star party, including AstroArts, Epson, Fujicolor, Kowa, Tele Vue, Takahashi, Vixen, Pentax, Showa, Mutoh, Miyauchi, and Fujinon. <caption>The hunt for bargains lasts until well past midnight. Rows of brightly lit booths and tents show their wares, from premium apochromatic refractors, cameras, eyepieces, and telescope accessories, to space art, astronomical T-shirts, jewelry, and trinkets. Other stalls vying for the attendees' attention sell hot meals and cold beverages, including beer and sake (Japanese rice wine). <caption>Following the tradition of the Stellafane telescope-makers' convention, Tainai also showcases homegrown ingenuity, such as this motorized observing chair for scanning the skies with giant binoculars. Here S&T contributing editor Stephen James O'Meara takes the chair for a test drive while editor in chief Richard Tresch Fienberg (far right) looks on. <caption>Unlike its American counterparts, where white lights, flash photography, and loud music are strictly banned, the Tainai Star Party features Saturday-night folk and rock concerts, complete with strobe lights and fireworks. Performers include editors of Tenmon Guido, the country's largest monthly astronomy publication. People who want to do some "serious" observing set up their scopes or camp out in outlying dark areas away from the main exhibit grounds. Fig. #6A and #6B: Photos of kids with stuffed toys and with a giant bettle, respectively. <caption>Left: Activities to keep youngsters preoccupied include raffles of toys (above) as well as computer games, astronomy quizzes, and hands-on demonstrations on biology and weather forecasting. Right: Kids also play with Japanese stag beetles, tying them on a string and twirling the beetles to make them fly. Photographs by P.K. Chen and Richard Tresch Fienberg, respectively. <caption>Popular daytime activities include boomerang-throwing demonstrations and model-rocket launchings. 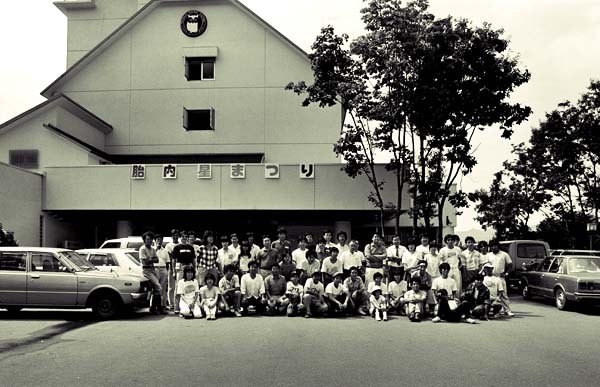 In 1996 Tainai also held a 20-km bicycle race. Shigemi Numazawa wishes to thank Akira Banch and Yoko Suzuki who translated Japanese to English.